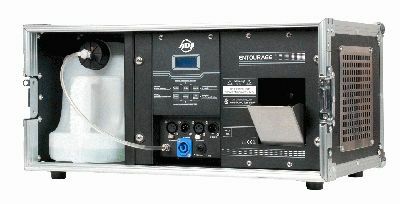 The Entourage is a hybrid between a conventional fog machine and a haze machine. It uses economical water-based fog fluid, but disperses it thinly over a much wider area to create the perfect atmosphere for vibrant mid-air beam effects. Ideal for touring or larger venues, the Entourage is actually built inside a robust road case. It is fitted with a heat vent, allowing the machine to run safely from within its protective shell. It is also fitted with rubber feet, allowing it to stand directly on a stage without slipping or scratching the surface. Offering easy setup and operation, as well as an exceptionally quick warm-up time of just 45 seconds, the Entourage can be ready for action in no time at all. It is also capable of continuous operation and incorporates a built-in 5.6 Liter fluid tank, which means that is ideal for use on large tours and productions when a large amount of atmospheric faze is required. In addition to its ability to generate continuous output, if required, the Entourage is also fitted with an easy-to-read LCD display interface that facilitates simple configuration of an in-built timer. This allows bursts of variable intensity and length to be programmed to occur at regular intervals. The machine can also be controlled by DMX using a choice of three different modes: 1, 2 or 5 channel. Measuring 21” x 15.25” x 9.75” (533mm x 387mm x 249mm), and weighing 47 lbs. (21.3 kg), the Entourage is a relatively compact and lightweight machine, especially when considering its output and that no separate road case is required. It features a professional locking PowerCon mains power input socket as well as both 3-pin and 5-pin XLR DMX input and output sockets for maximum flexibility. “I think the ADJ Entourage sets a new standard for products in this category,” enthuses ADJ USA’s National Sales Manager, Alfred Gonzales. “At ADJ we’re passionate about offering our customers products that deliver exactly what they need, while also making their lives easier. In creating the Entourage, we really tried to include absolutely everything that would make a professional faze machine powerfully effective but also easy to use out on the road. That’s why it is actually manufactured inside a road case and has both 3-pin and 5-pin XLR sockets as well as a variety of easily-accessible operating modes”. For concerts, clubs and stage productions that use moving beam effects, the right atmosphere is essential and ADJ’s Entourage is a professional tool for creating it. Regardless of the size of a venue, the Entourage is capable of filling it with light-enhancing faze from a machine that is reliable, flexible and, above all, powerful.